Our country is in the midst of an obesity epidemic. While the previous phrase sounds like a flashy headline, it turns out to actually be very true. More and more, citizens are turning to fitness and nutritional eating to turn their lives around and maintain a healthy lifestyle. This action is ideal for many adults, and if you’re considering adopting a child, the best time to start is now. 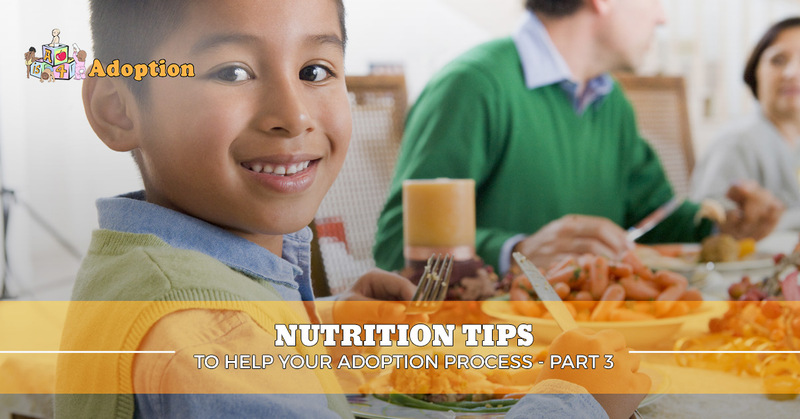 Today, we’ll continue our blog on nutrition tips that can give you the energy needed to take on the adoption process and also lay the groundwork to give your child a lifetime of healthy practices. A is 4 Adoption is your source for efficient, caring services to help birthmothers and adoptive parents every step of the way. While every adoption agency in California struggles to navigate the red tape of open adoption, our guides work with experience to create a custom adoption plan for your unique situation. By offering birth mother help and support services, we strive to create the best possible outcome for the child. We know everyone wants the best, which is why we’re focusing on nutrition and parental tips to avoid common feeding mistakes. If you are thinking about putting your child up for adoption or are looking to grow your family, our adoption center is ready to help! Reduce overall fat. Limiting the fat content of your meals can help in the long run to lessen the strain put on your body and metabolism. Grilling or baking food can help to make nutrients easier to absorb, filling you up quicker and reducing your total food intake. Remember to use caution, though, as many vitamins and minerals are lost during the cooking process. You can also make use of olive or canola oil in place of butter and vegetable oil when cooking to make the entire meal more healthy. Avoid food rewards. One practice that many parents get into is rewarding their children with food as opposed to praise or any other prize. Offering ice cream to complete homework, for example, creates an expectation for delicious treats that can start an unhealthy habit. Children who associate calories with rewards are more likely to develop improper eating styles, often overeating in the process. Avoid the clean plate rule. One sense of pride for many parents comes from the enjoyment of their meal. Others worry that their children aren’t gaining enough nutrition. In any case, instructing your child to eat their plate clean is not a good practice. Be sure to serve smaller portions with each meal, and if your child is hungry for more, they can request additional deliciousness. Overeating is a major contributor to obesity in our country, and changing our eating habits is one way to break the mold. Utilize healthy snacks. Throughout the day, your child may become famished. Be sure to provide simple, healthy snacks to provide them with the nutrition and energy they need. Otherwise, they may seek out sugary, high-calorie items for a quick fix. Set a healthy example. Young children look to their parents as a guide for how to act and behave in society. For this reason, they look to you for eating habits. Stock up on healthy foods to set the right example for helping your family gain the edge in proper eating. While our list may be helpful for the basics of proper nutrition, it is by no means comprehensive. Adults who are thinking about adopting a baby will have a long list of tasks to do before the big day arrives. From preparing the bedroom to finding a pediatrician, the list seems to go on. Supplying a healthy diet will give you and your new miracle the building blocks for a long, healthy life. The adoption process can be a long, complex affair, which is why we are here to help! A is 4 Adoption was founded to guide you every step of the way, from the moment you fill out our contact form to infancy and beyond. Our services aim to outperform any adoption agency in California. Contact us today to find out how!